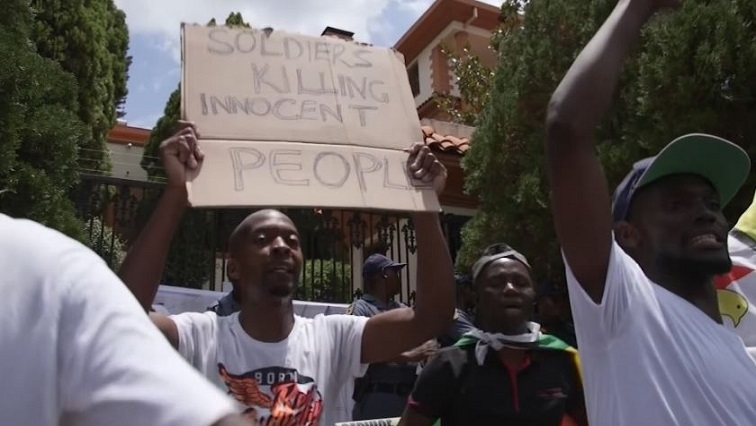 Zimbabwe soldiers accused of beatings amid protest crackdown - SABC News - Breaking news, special reports, world, business, sport coverage of all South African current events. Africa's news leader. Residents in two Harare townships and a neighbourhood in Bulawayo say soldiers beat people walking in the streets on Tuesday night. Soldiers beat people on the streets of Zimbabwe’s capital and second city Bulawayo overnight, residents said, hours after President Emmerson Mnangagwa promised to investigate a security service crackdown on anti-government protesters. There was no immediate comment from the government or from the military which kept up patrols and checkpoints in both cities on Wednesday morning. The police and military have denied past accusations of excessive force. Lawyers and activists say police and soldiers have killed at least a dozen people, wounded scores and arrested hundreds since demonstrations began 10 days ago following a hike in the price of fuel. Police say three people died during the protests. Zimbabwe’s Human Rights Commission (ZHRC) has accused security forces of systematic torture, raising fears that the country is reverting to the authoritarianism that characterised the rule of Mnangagwa’s predecessor, Robert Mugabe. Residents in two Harare townships and a neighbourhood in Bulawayo said soldiers beat people walking in the streets on Tuesday night. “Soldiers just appeared in a truck and started beating up people at the shopping centre. They told everyone to go home and sleep,” said one resident from Glen Norah Township in Harare who declined to be named. The Zimbabwe Human Rights NGO Forum said a woman was arrested by detectives in the capital’s Kuwadzana township on Tuesday night and accused of preparing food for protesters. Mnangagwa had promised earlier on Tuesday to investigate the security services’ actions against anti-government protesters and called for a “national dialogue” with churches, civil society and the opposition. Zimbabwe’s legal system was also in focus as a court postponed a bail application by activist pastor Evan Mawarire on Wednesday and hundreds of others arrested during the crackdown awaited trial. Mawarire, who rose to prominence as a critic of Mugabe’s rule, was arrested on Wednesday last week and charged within citing violence to subvert the government – an offence punishable by up to 20 years in prison. State prosecutors argued that they needed more time to prepare their case and the hearing was adjourned until Friday. Campaign group Zimbabwe Lawyers for Human Rights has accused the courts of denying bail to anyone charged with public violence. The government has not responded on these accusations. On Wednesday, Mnangagwa swore in a new prosecutor general, Kumbirai Hodzi – a candidate widely criticised by the opposition after he told an interviewing panel last year that he took instructions from the executive when deciding who to prosecute. Mnangagwa promised during campaigning for the July 2018 presidential vote to repair the economy and break with Mugabe’s politics. But a spokesman for the president said on Sunday the crackdown was a foretaste of how authorities would respond to future unrest. With high inflation and a shortage of cash in circulation eating into ordinary Zimbabweans’ spending power, the fragile state of the economy is at the heart of the country’s political troubles. This entry was posted on 23 Jan 2019,07:39PM at 7:39 PM and is filed under Africa. You can follow any responses to this entry through the RSS 2.0 feed. Both comments and pings are currently closed.